Mary Ethel Horton McRath was born on September 5, 1933 in Elizabethton, Tennessee, she was the daughter of Josephine Bass and Gilbert Horton. Mary Ethel, affectionately called “Nanny”, by everyone she knew, transitioned to eternal life of Thursday, January 31, 2019, her family and closest friends were by her side at the time of her passing in Elizabethton. 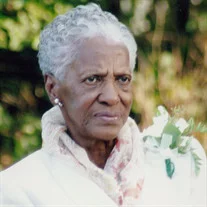 Mary Ethel was a homemaker and was a loyal and devoted member of Browns Chapel AME Zion Church in Elizabethton. More than anything, she loved spending time with her beloved family. Mary Ethel leaves to cherish her memories, her son, Kenneth (Sandra) McRath; her daughter, Joyce (Andre) McRath; her grandchildren, Tiffany (Sylvester) Taylor, Travis (Tara) McRath, Troy McRath and Tonya (Michael) Stewart; her great grandchildren, Kahlil, Trey, Taj, Sydney, Tamera, Sydney, Cameron and Tayson; a great great grandchild, Valerie; and a host of wonderful cousins and special friends. A service to honor and celebrate the life of Mary Ethel Horton McRath will be conducted at 2:00 PM on Saturday, February 9, 2019 in the Chapel of Peace at Tetrick Funeral Home, Elizabethton with Pastor Jeannette Clark and Pastor Tracy Haynes, officiating. Music will be under the direction of Walter Hall and Loretta Bowers. The family will receive friends from 1:00 PM until 2:00 PM in the funeral home chapel, prior to the service on Saturday or at the residence at other times. The graveside service at Happy Valley Memorial Park. Active pallbearers will be selected from family and friends. Mary Ethel and her family are in the care of Tetrick Funeral Home, Elizabethton. Office 423-542-2232, service information line, 423-543-4917.